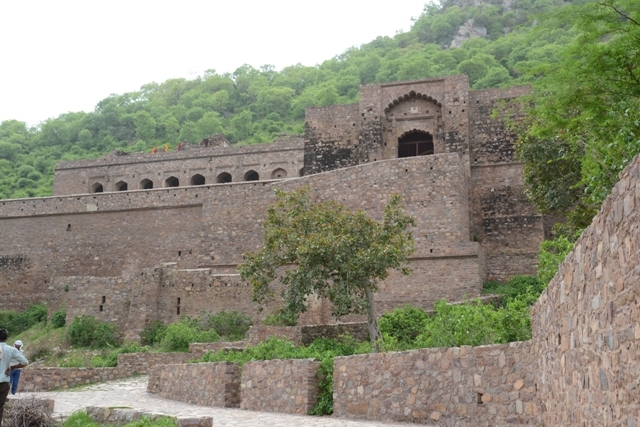 Bhangarh Fort near Jaipur in Alwar district of Rajasthan is one of the upcoming tourist attractions near Jaipur. It is known for its historical ruins and becomes a center of attraction for adventure loving people as it has been designated as one of the top ten haunted places in India. Even the state government’s signboard at the entrance of the gate clearly mentions the entry to be banned before sunrise and after sunset. This has added to the top ten haunted places of the people visiting the fort. Bhangarh Fort has been at the center of research for several historians and researchers all over the world. The visitors here have peculiar stories of their visit. While some get frightened by the peculiar and awkward feeling of the place within the ruins while others believe it to be just a state of mind. Still, there are numerous haunted tales associated with this fort. However, their authenticity still remains a mystery. Researchers have tried hard to track the history of this fort, its birth to its devastation, but they have not been able to reach a unanimous decision. While one historical story associated with the fort relates its devastation to the curse of Guru Balu Nath who used to meditate at that place. On request of Madho Singh, he allowed him to build the fort on the condition that the shadow of the fort would never reach him but Ajab Singh, the grandson of Madho Singh, ignorantly, raised the height of the fort to such an extent that its shadow reached the forbidden place. Hence, the destruction happened. Another story about Ratnavati, Princess of Bhangarh Fort and the magician Singhia is often heard for the Bhangarh fort. It is said that Princess Ratnavati was known for her beauty in Bhangarh Fort and adjacent areas. Singhia who was a tantric/ magician was also very fascinated by her beauty. But, he knew that the princess would never accept him due to their mismatch in beauty and status. He planned to cast a black magic spell on the oil that princess’ maid was buying in the market for her. Princess Ratnavati, who herself knew black magic came to know about this and threw the oil on the ground. It turned into a boulder and started rolling down the hill. Singhia, at the bottom of the hill, saw his death coming to him and cursed the princess and her fort. It is said that the fort was ruined before the next sunrise and Princess Ratnavati also died next year in a battle between Bhangarh Fort and Ajabgarh. The localities still believe in the re-incarnation of Princess Ratnavati and are waiting her to visit this fort and free it from the curse. Bhangarh fort has several tales of its beauty. Over 10000 dwellings make it archaeologically significant. Lot of tools used by early men were excavated here by ASI. It gives an insight into medieval era. There has not been any habitable place near its surroundings owing to the scary ghost stories associated with the fort. But recently, the number of people having their households in the nearby areas has risen. Yet, they too are not free from a peculiar characteristic. The households here do not have a roof as it is a myth that whenever one tries to build a roof on the house, the entire house falls because of the curse that led to the devastation of the entire grand fort! The Bhangarh Fort has beautiful gardens, havelis, banyan trees and temples of Gopi Nath, Mangla Devi, Keshav Rai and Lord Someshwar. The fort is surrounded by a ruined wall. There is also a umbrella like structure called chattri on the hill adjoining the fort. It is also known to have lots of beautiful springs and falls. One of them can be still seen near the temple of Lord Someshwar here. Surrounded by hills on three of its sides, it offers a spectacular view. However, the mismanaged placement of its ruined buildings brings a strange feeling making people feel anxious and restless or might be it would be just a state of mind! The mystery still remains a mystery – unsolved and unknown!